Dudes are trademarks of MEGA Brands Inc. or its affiliates. For more information, please visit www.megabrands.com and www.megabloks.com. 1. Children Thrive On Routine And Predictability: Practice patience with your child by creating a set playtime and sticking with it. 3. Round Out Your Activities: Come up with fun ideas for activities, in a range of developmental areas! 4. Make Good Organized Play Space: Kids need a place to play and it should be equipped with basic items, and without parental worry of noise, spills and property damage. 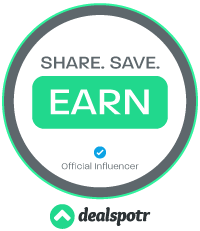 · Bonus Tip: If you have more toys out and active than your child can clean up in five minutes, you have too much going on in your playroom. 5. Let the Child Lead: When you join your child in play, let them lead the play – this is their time to explore and learn through mistakes. 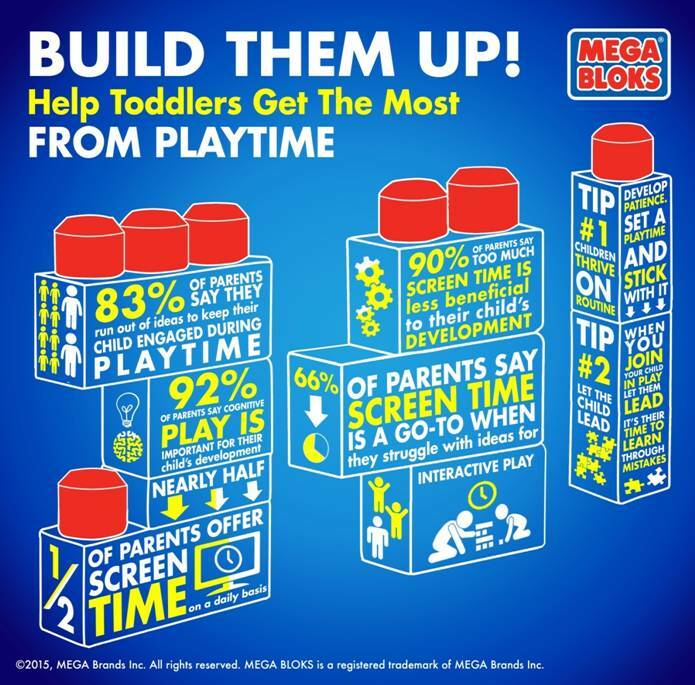 MEGA BLOKS are sold at all major Canadian retailers including: Toys R Us, Walmart, Sears, Real Canadian Super Stores and Amazon.ca. Get ready to discover wiggly fun and musical sounds with the Move ‘n Groove Caterpillar by MEGA BLOKS. Pull this adorable wheeled caterpillar along, and music will play as building bases magically appear on its back! This happy little critter comes with seven blocks in new colours and patterns, as well as an adorable buildable bumblebee that little ones can stack on the caterpillar’s back for building on the go! It’ll be a big day of fun in the country for little farm hands thanks to the MEGA BLOKS Friendly Farm. Its eight panel-style blocks help children build taller and faster. Re-arranging the panels lets them build the farm in different ways. 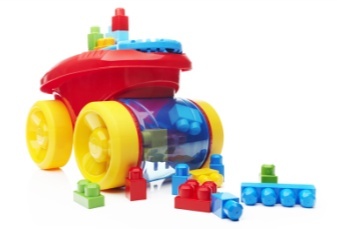 Imaginative play for children continues with detailed blocks that bring the farm scene to life. Including a barn, stables, a chicken coop and characters, little hands can open up the world of Farmer Block Buddy™! 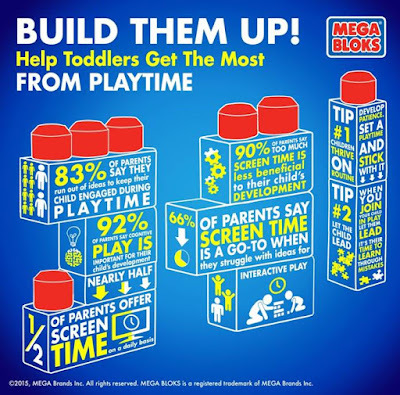 MEGA BLOKS original hero product, the award-winning Big Building Bag offers amazing play value and endures hours of fun. Its bright-coloured blocks encourage hands-on exploration as children imagine and create. These unique blocks are big and easy for little fingers to assemble. When playtime is over, return the blocks to their eco-friendly bag and stash them in the toy box until the next adventure.Learning comes to life with this interactive laptop! Baby can press nine keys or the toggle space bar to hear songs and phrases about letters, numbers, colors and more. Open and close the lid to hear opposites, too! An LED screen displays exciting images and patterns. Slim handle and sleek design make it great for playtime on-the-go.Learning comes to life with this interactive laptop! Baby can press nine keys or the toggle space bar to hear songs and phrases about letters, numbers, colors and more. Open and close the lid to hear opposites, too! An LED screen displays exciting images and patterns. Slim handle and sleek design make it great for playtime on-the-go. Little builders can expect lots of fun surprises with MEGA BLOKS’ brand new Block Scooping Wagon! This colorful classic combines wagon play and construction fun with an element of surprise. The wagon picks up blocks as your little one pushes the wagon over them. The blocks spin around inside the clear compartment as a child pushes the wagon along on its big sturdy wheels. This wagon certainly makes clean-up part of the fun! 1 Canadian reader will win! My nephew would love this toy! I entered for my 3, almost 4 grand kids. I'd give this to my little nephew...Thankyou.